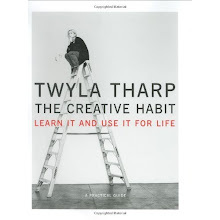 "(...)If you try and it doesn't work You'll try a different way next time. Doing is better than not doing, and if you do something badly you'll learn to do it better(...)"
Anyway, a few years later and I still get this feeling sometimes but finally I started to use my resources instead of just collecting them..yeah! The next Big Question is - which way to turn and where to start, which idea, project, inspiration...and this is really a hard one for me. I would love to split into six different people and do everything in one time..but this won't happen unfortunately so as a first step I've decided to just simply follow projects from the books I own and see where this will lead me. 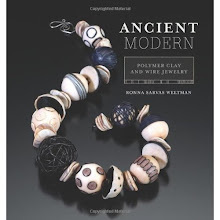 One of my favorite books about polymer clay jewelery is "Ancient Modern" by Ronna Sarvas Weltman, I listed it on the right. I've started to work on the first project listed in the book, and not everything is as easy as it looks.